Gainesville, FL- It appears that Luke Del Rio will not miss the remainder of the season, as many fans expected after a scary incident in the third quarter of the North Texas game on Saturday night. Zach Abolverdi, of SEC Country, first reported that sources indicated Del Rio suffered a MCL sprain and will return to action this season for Florida. 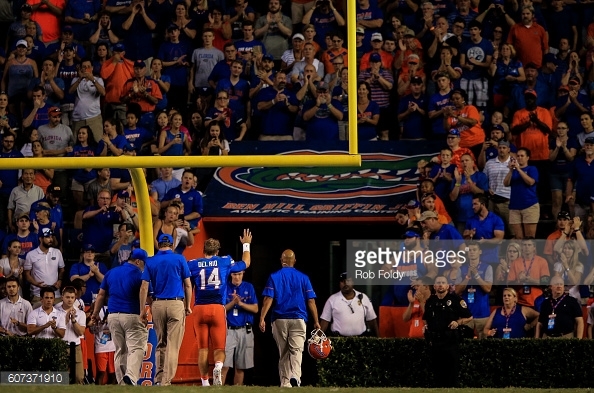 Abolverdi also reports the Gators expect Del Rio to miss only two to three weeks. Florida head coach Jim McElwain confirmed to reporters Saturday that Austin Appleby is the “next man up.” Appleby transferred to Florida from Purdue this summer and has thrown 19 career touchdowns to go along with 19 interceptions.